Followers of this blog may already be aware of a couple of great Kickstarter projects going on right now. One is by Nathan of Outloud Imaginations and the other is by Bill Trammel and Nate Veldkamp. 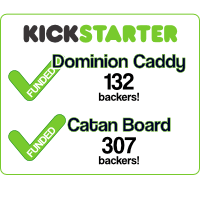 They have both created boards that solve the problem of Catan tiles that shift around. 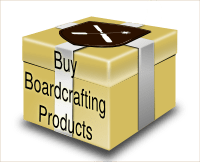 Their campaigns are at Handcrafted Settlers Gaming Board & Storage and Official Settlers of and Catan Gaming Board respectively. Nathan’s Handcrafted storage / playing surface is quite elegant. I dig the use of wood, the bold stain, and the convenience of keeping all the components housed within the base. Since seeing their great platform, I’ve been daydreaming about how nice the Boardcrafting Catan tiles would look inside it. Bill and Nate, in what I’m sure was no easy feat, have achieved “Official” status with their board. The folks at Mayfair and Catan GmbH have put their seal of approval on the creation. And I’m also very impressed at how they were able to get such a low price point, making the board available to an extremely broad market. I also dig the commitment to support all the possible board layouts, even gargantuan Seafarer’s configurations. This community is making strides. I am excited. With each of these new projects, the market grows, people start talking, and ideas and inspiration are seeded in the minds of both creators and players. Beyond these current Kickstarter projects, there are a couple other creators I’m keeping an eye on. Lyris Laser Studio, launched by Barry Figgins (via Kickstarter earlier this year) has accessories for more than just Catan. Citadels, Descent, Munchkin, there are many accessories here for popular games. Barry, you have vision. This entry was posted in community, Kickstarter. Bookmark the permalink.